this post was promised to stevieK a long time ago and i didn’t have the chance to type it up until now. 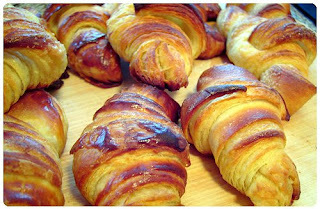 so first i am going to start with the history of the croissant and then go into my detailed description. hope y’all enjoy! in 1891, but it wasn’t the same kind of croissant we are familiar with today. wasn’t published until 1905, and, again, it was in France. i often wonder when i am eating the croissants here if they are just subconsciously better because i’m actually in france? or are they really just better? update: i did a little research on the recipe for croissants and to my question of “are they actually better in france?” the answer is yes. in america we don’t really have the type of butter that is apparently best for making croissants so they are actually better in france for a real reason and not just my subconscious!